Occasionally during regular use of the Developer's Kit printer, the silver cartridge can become out of sync. This will cause a myriad of other issues while running the printer, and should be a quick fix. Silver does not change position during alignment, printing, or while running "Raise Silver" or "Lower Silver" on the Touch Screen. 1. For this repair, you will need to fully remove the silver print head (see Picture 001). Picture 001: The silver print head removed from the Voxel8 Developer's Kit Printer and ready for repair. You will need to disconnect the pneumatic tube that plugs into the manifold on the Print Engine (see Picture 002). This is done by depressing the white o-ring around the tube and pulling up on the tube. Picture 002: The Push to Connect that needs to be disconnected. Picture 003: Pushing the slider down and back into sync. Slider should move freely after pushing. 3. 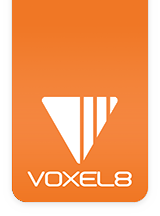 Reinsert the silver print head into the Voxel8 Developer's Kit printer. Reattach the clear pneumatics tube back into the manifold located on the Core XY carriage (see Picture 004). Picture 004: The silver print head has been reassembled, loaded with silver, and ready to print. 4. Test the repair done by selecting "Lower Silver" and "Raise Silver" from the touch screen a few times.